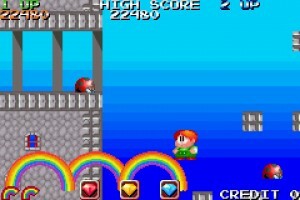 IMHO Rainbow Islands remains the most iconic, influential, well designed and balanced arcade platform EVER devised by man. It has buckets of replayability, oozes cuteness, and doesn’t stop surprising you with bonuses, power ups, special items, and huge bonsues for skillful play. Yes, I hereby admit to being a “Rainbow Islands Fanboy”. When it came out on the Commodore Amiga back in yonder days, my friends and I played it competitively to smash each others high-scores, it became so competitive that we even had tables of our own for each stage, let alone each island. 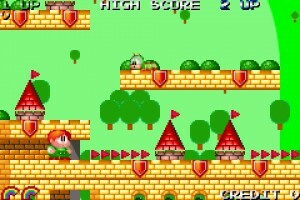 Skillfully devising a new path through a stage to earn maximum points became essential to earn an extra 10 points by the end of it. 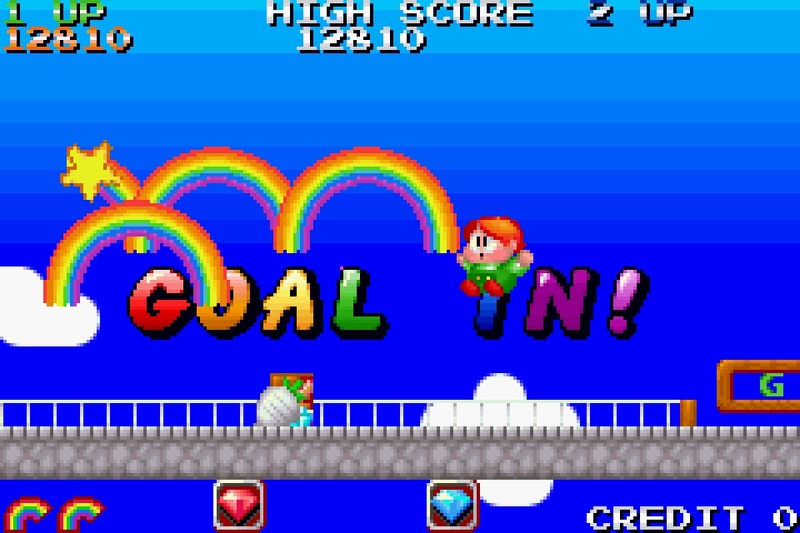 Naturally, being adept (cough) – I completed the game first, earning a respectable 13 Million points+… but it didn’t last long, when one of my friends also completed the game, but getting all of the Rainbow Diamonds in order, securing him a massive 50 Million point bonus at the end! 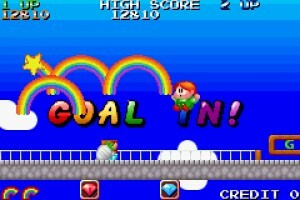 But, suffice to say, I came back and hammered his total high score with 65 Million+ points, and that was that. 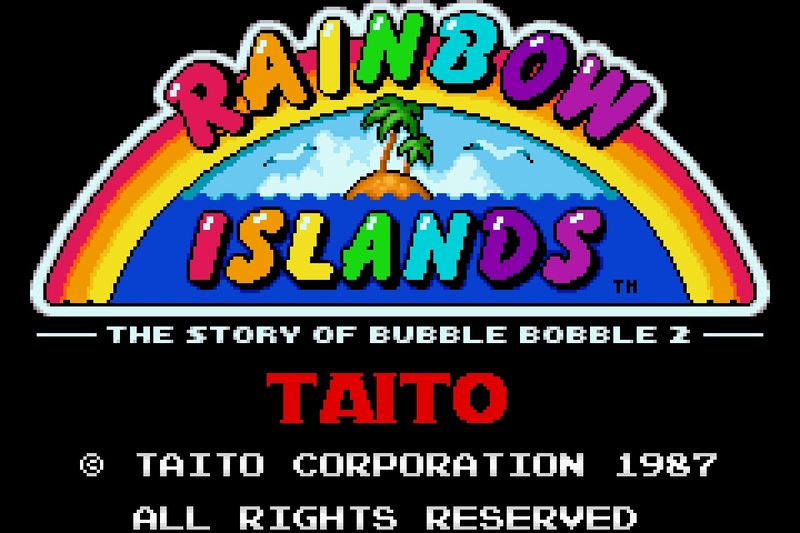 Being sufficiently impressed and addicted to Rainbow Islands, when I had the chance to write a game engine on the Nintendo Gameboy Advance, RI became the project to test drive my engine technology. The sprite graphics came from the tastefully enchanced 256 colour PC conversion by Probe, I wrote ripping tools to get the image and map data from their format, and convert it to mine. I wrote a basic Map editing tool to handle my tilemap based games, and added importers to it for RI. The backdrop is my own, to add a colourful – but simple – parallax scrolling environment – bear in mind the GBA has a very small screen (not even wide enough to fit the RI level widthwise) so keeping the scene “uncluttered” is important. I converted most of all the first island (Insect Island) apart from the Spider Boss, and the little Mino-suki cocoon fella from the first level. 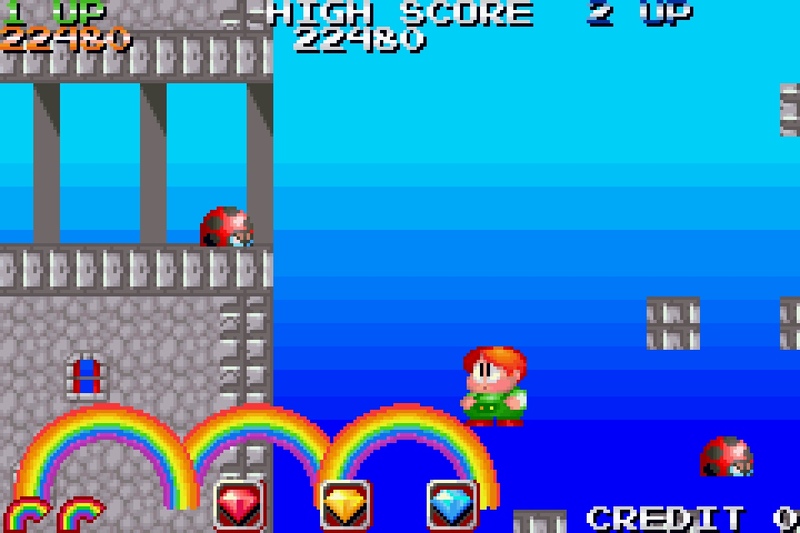 The grand plan was to produce a “Compendium” pack – with Bubble Bobble, all the Rainbow Islands levels (with the hidden / secret ones), and a new unlockable “Pinbubble” game (Pinball themed on both these games) all on one cartridge. 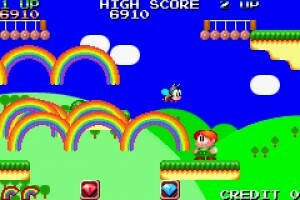 Sadly, I couldn’t manage to get in touch with Taito to discuss anything. And then of course, a year or so later Bubble Bobble came out on the GBA, and it was (IMHO) utterly ruined, but – there you go! Feel free to download the Nintendo Gameboy Advance binary here, it plays on real hardware – and via the various emulators about the web.